It's the middle of the night, and your little one has woken up and is now crying inconsolably. You find they're running a mild fever, and tugging on one of their ears. The cause could be an ear infection. An ear infection (also known as acute otitis media) is an infection inside the child's middle ear caused by a virus or bacteria. They are very common in children between six months and three years of age. They often occur after a child has had a cold for a few days. We know that 75 per cent of children will experience at least one ear infection by the time they reach school age. The good news is that ear infections are usually not serious and they aren't contagious. But that doesn't stop parents from worrying about whether they should make a trip to an emergency department, often in the middle of the night. 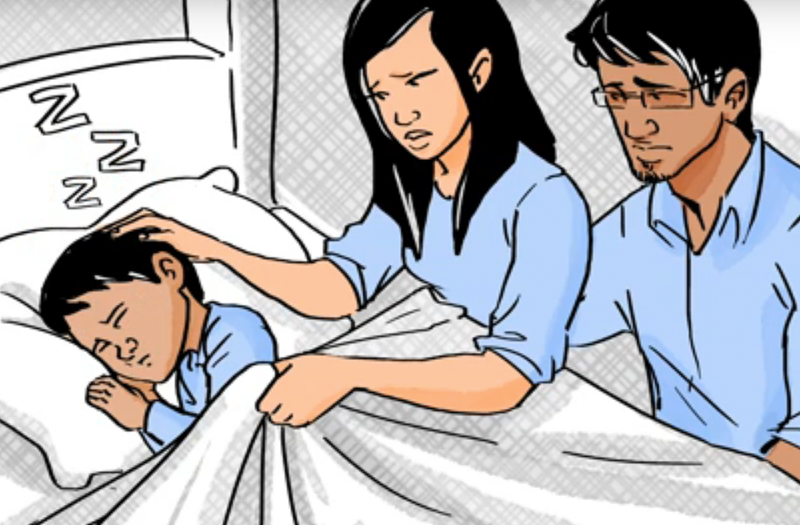 To help parents and guardians cope, Translating Emergency Knowledge for Kids (TREKK) has partnered with Drs. Shannon Scott (ECHO) and Lisa Hartling (ARCHE) from the University of Alberta, to produce a short video on ear infections. 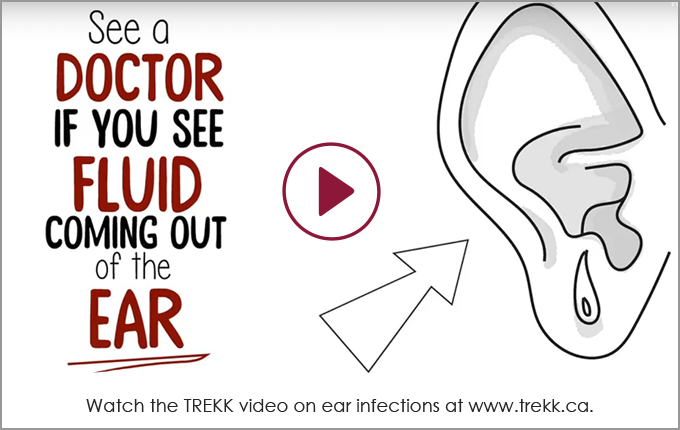 The video, which can be viewed at www.trekk.ca or on YouTube, outlines how to identify the signs of an ear infection, what you can do to comfort your child, and when to see a doctor or go to an emergency department. Tugging or pulling on an ear. Doctors diagnose ear infections by looking at the ear drum with an otoscope. They look for fluid in the middle ear, at the colour and position of the ear drum, and monitor the pressure in the middle ear. The majority of ear infections will go away on their own in two to three days after symptoms first appear, and do not require antibiotics. However, if you see fluid leaking from your child's ear, or if they have a fever above 39 C (102.2 F), or if they don't get better within two days, take him or her to your family doctor or a primary-care provider. The doctor may prescribe antibiotics if your child is moderately to severely ill with a high fever over 39 C, and hasn't improved in 48 hours. While it used to be standard practice a decade ago to give a child a decongestant or a cold medication, that is no longer done as it has been shown that these medications do not work in children. We recommend that parents administer pain medication for comfort and to help their child get a good night's sleep. Even when a child's ear infection requires antibiotics, it can still take a day or two for the pain to improve, so pain relief measures are still important. Give them Children's Tylenol or Advil (or generic alternatives) as per instructions on the bottle to help with fever and pain. Do not give your child aspirin, as it may cause Reye's Syndrome. Put extra pillows under the child's head, to prop them up in bed. Put a warm compress on the ear to ease the pain. Make sure to check that it isn't too hot, especially in infants who cannot remove the compress by themselves. Put them in a warm shower to allow the steamy air to unclog nasal passages and the middle ear. Along with head colds, factors that may also put children at risk for an ear infection are: living in a house with a smoker, bottle feeding while on their back, and using a soother for a prolonged period of time. Children who attend daycare may have more ear infections because they catch more colds. Prevention is key to avoiding frequent ear infections. Breast milk has antibodies that help fight infections, so breastfeeding rather than bottle feeding can make a difference. If your infant is bottle-fed, hold them upright while feeding. When they are old enough to hold their own bottle, they should be taught to drink from a regular cup (not a "sippy cup"). Teaching young children to wash their hands does lessen the chance of them catching a cold, which can lead to ear infections. Getting a flu shot can also help protect your family against influenza. Dr. Darcy Beer is a pediatric emergency physician at Health Sciences Centre Winnipeg, Children's Hospital, and the Manitoba lead for TREKK. This column was originally published in the Nov. 23, 2018 edition of the Winnipeg Free Press.